EVO Shift 4G coming January 9th for $149 | Android Blast! Sprint has officially announced the EVO Shift 4G. The latest in Sprint's line of 4G capable phones will be available on January 9 for $149 after rebates. The EVO Shift features a 3.7-inch screen, full slideout QWERTY keyboard, 5 megapixel camera with 720p video recording, GPS, mobile hotspot, and Android 2.2. 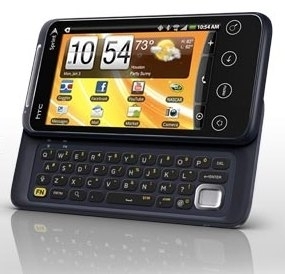 As the 16th 4G-capable device from Sprint, HTC EVO Shift follows in the footsteps of the award-winning HTC EVO™ 4G, bringing customers an attractive, compact design and an impressive list of features with the addition of a sliding QWERTY keyboard. Beyond the highly acclaimed HTC Sense user experience, HTC EVO Shift also boasts the power of 4G, Android 2.2™, a 5MP camera, 720p HD camcorder and a 3.6-inch capacitive touchscreen display with pinch-to-zoom capability.